rsItemNotFound400The item '/xxxxxx/Sales/Charts And KPIs' cannot be found.http://go.microsoft.com/fwlink/?LinkId=20476&EvtSrc=Microsoft.ReportingServices.Diagnostics.Utilities.ErrorStrings&EvtID=rsItemNotFound&ProdName=Microsoft%20SQL%20Server%20Reporting%20Services&ProdVer=9.00.5057.00Microsoft SQL Server Reporting Services9.00.5057.00127OsIndependent1033ReportingServicesLibraryThe item '/xxxxxx/Sales/Charts And KPIs' cannot be found. 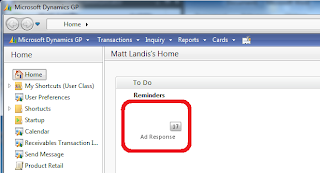 Microsoft announced that a Dynamics GP Web Client is coming. At the GP General Session at Convergence 2011 this drew a lot of wows from users and partners. This product will not be out for another year so there are a lot of unknowns at this point. My suspicion has been for some time that Microsoft is taking baby steps towards a web ui. Things like the web based components that kept appearing such as Navigation Panes, Navigation List preview pane and most importantly the SQL Reporting BI and reports which render on web engine. Here are Some questions and the answers I could uncover. 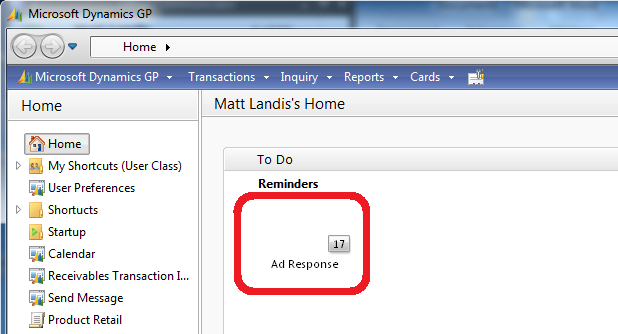 Q:What does GP Web client UI look like? Ever have someone that wants to see GP Items that didn't sell lately?